← What do BBC journalists think you should be reading? Here is another one of those filmed BBC backgrounder reports – presumably intended to provide BBC audiences with information and context which it might be more difficult to give in reports from the field. 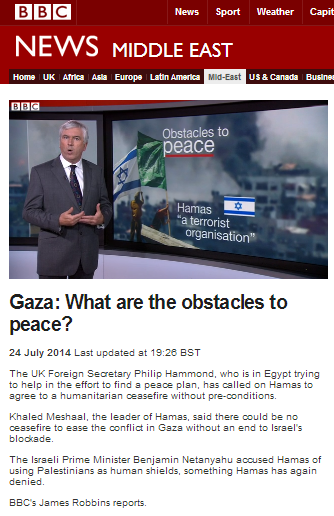 This one – produced by BBC News’ diplomatic correspondent James Robbins – appeared on the BBC News website’s Middle East page under the title “Gaza: What are the obstacles to peace?” in addition to being aired on BBC television news programmes. Later on, Robbins purports to explain the item’s main topic to viewers. Yet again we see BBC amplification of Hamas’ pre-condition for a ceasefire without proper clarification to BBC audiences regarding the Hamas terrorism which brought about the introduction of restrictions by both Israel and Egypt in the first place. We also see a highly inadequate portrayal of the smuggling of weapons into the Gaza Strip. Robbins goes on to present half a story with regard to Hamas’ founding principles, deftly avoiding any mention of the violent practical manifestations of Hamas’ refusal to recognise Israel. He then makes an unsourced claim which this writer at least has not heard made by the Israeli government in the format in which it is presented here. This is not the first time we have seen Hamas’ terror designation being misrepresented in BBC reports during the current round of conflict, although it has much more frequently simply been ignored altogether, meaning that audiences are not made aware of the basic fact that these hostilities are actually between a country and a terrorist organisation. Hamas is of course defined as a terrorist organization by Israel, the United States, the European Union, Canada and Japan – as the BBC’s own profile of Hamas clearly states. In addition, Jordan and Egypt have banned Hamas and Australia designates Hamas’ Izz al Din Al Qassam Brigades as a terrorist organization, as do New Zealand and the United Kingdom. But no less bizarre is Robbins’ suggestion that Hamas should be seen as an “elected government” – not least because no PLC elections have taken place in over eight and a half years and the term of the PLC legislature elected in 2006 with a Hamas majority expired in 2010. Clearly this latest backgrounder contributes little if anything to BBC audiences’ “understanding of international issues“. Have you ever covered the reportage of Robert Fox? I heard him on World service between 8.15-8.45 this morning, complaining that he could never say a word criticising Israel without being called antisemitic. One thing everyone agreed on, he said, was that Israel was being disproportionate. I checked and he is a veteran war reporter. Then a young woman pundit said that although she had no brief for Hamas as they were extremists, they were not terrorists as they were no different from the French resistance fighting Nazi occupation, as the Gazans had been cut off for years and years. This now often repeated French resistance analogy has gone from fringe to yet another false truism. amie; Your comment’s show a complete lack of perspective. The French Resistance attacked MILITARY targets. They did NOT deliberately target civilians, German or French. To compare Hamas TERRORISTS to legitimate freedom fighters does a great disservice to the latter. You’ve misunderstood Amie’s comment. In fact, Amie is saying what you are saying. They’ve got this completely the wrong way round. Deliberately? Israel said that it would continue operations against tunnels used by Hamas during the truce period. Hamas has accused Israel of using previous ceasefires to prepare more attacks, and claimed that there had been truce violations during Saturday. Posted in wrong place. Please delete. Thank you for the correction Richard.